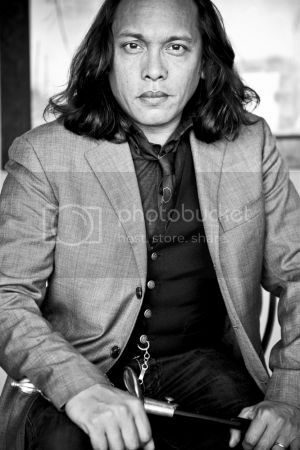 Sam Sarkar is not only a fantastic writer, he's also Vice President of Johnny Depp's production company, Infinitum Nihil. I am still very honored that Sam reached out to me, here at JohnnyDeppReads and spoke with me on the phone for about an hour about THE VAULT, CALIBER and some other ventures. Sam Sarkar talks to JohnnyDeppReads! A couple of weeks ago, I was contacted and asked if I'd like to read the first book in Sam Sarkar's newest comic book series "The Vault." And I could also interview Sam. Well, you bet I was thrilled to have been given the opportunity to talk to Sam and to see his new book. I loved his last series "Caliber" and we discussed it here on JDR. We also kept up with the project in this "Caliber" forum. Everyone who follows Johnny Depp's career has heard about his friend Sam Sarkar, who's also a Senior Vice President of Depp's production company, Infinitum Nihil. In his own right, Sarkar's a very talented writer and has a fabulous vision for films, books and stories. He's also a nice guy. I sat down for not quite an hour a couple of weeks ago and visited with the very talented Sam Sarkar. Below is our conversation. I've added in some pics and links. We will be discussing "The Vault" after the first of the year. And we know that Depp's Infinitum Nihil has optioned Sarkar's "The Vault" to be made into a film. SS: Oh thanks so much! And thanks for talking about “Caliber” a couple of years ago! JDR: You’re welcome! We loved “Caliber”!! I have to ask, when is this going to be a movie? SS: Well, it’s funny because I haven’t heard anything from Radical lately, but I wanted to focus on “The Vault” before I tried to do anything about “Caliber.” They seem to be focused on other projects which is fine for them, I think it was something I was always more passionate about ultimately. Movies take a lot of patience and passion and if you don’t have it for a particular project, it’s hard to keep it going. But I have the patience and passion for it…“Caliber’s” another one, it’s like “The Vault” – those are things from my childhood, you know I’d always wanted to do. It was funny, at “The Vault” signing, one of the signings I did at the comic book store in L.A., Golden Apple Comics, this guy came up and he had done a drawing, he gave me a drawing from “Caliber” that he did of Whitefeather. He did his own interpretation, it was beautiful! I was really amazed like that, that someone thought about it that much that they would actually recreate the image in their own imagination, it was kind of cool. SS: Yeah, that hit, that was fun. That was a lot of fun. JDR: So that’s (“The Vault” as a film) moving forward then? JDR: Can you speak about it with me? SS: A little bit. You know, it’s one of the best parts of working where I work, to work for Johnny and Christi, that I have the ability and opportunity to do these things that I’ve done and not only that, but have them be a part of the company and be something that the company can do well with. And it was a surprise you know. Denis O’Sullivan at Graham’s company was the main champion. I showed it to him a year ago, before the books came out and he loved it. He’s always been a big supporter of the concept over there, but I didn’t expect that automatically Graham and his execs would just take it, they’re very specific about what they want to do with films. Graham sent me a note himself, it was really nice that they embraced it they way they did. I was very excited. JDR: How exciting!! It is so well deserved! When I was contacted by Gianluca Glazer about seeing “The Vault” and speaking with you, I was so thrilled! 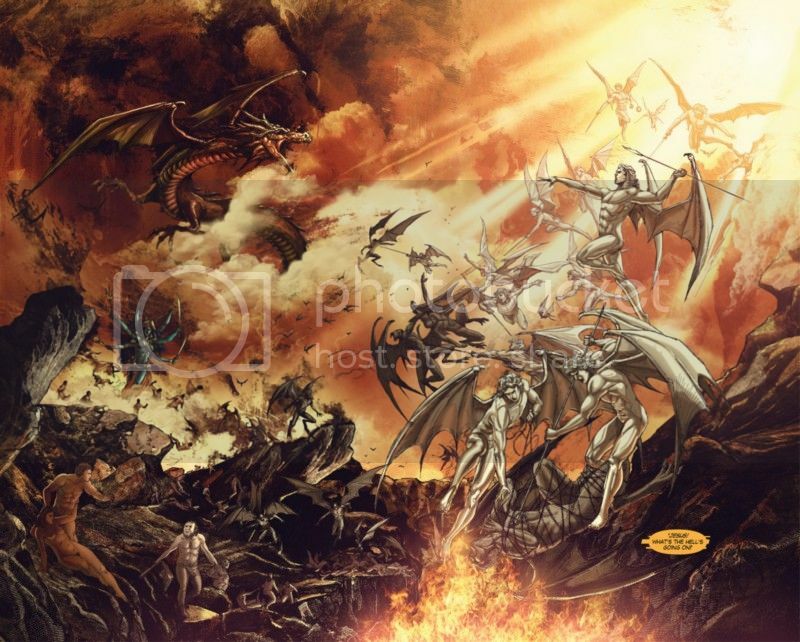 I’ve read the first issue, reviewed this book for my Depp site, you read my review and so you know I commented that you’ve got lead characters named after the Archangels, you’ve got someone named Jesus, you’ve got Revelation added in. Can you tell me a little but about why you chose those names? SS: Yeah, it’s going to part of the bigger storyline. At first though, it was a bit of… like a joke, to see how far I could go with those kinds of biblical references before it got kind of silly. But actually when you look at “Alien” it’s the Nostromo, there’s something kind of mystical about the names that they used with it. But I thought it’s fun, let’s see how this works, and actually Revelation is a perfect name for a ship, it’s an oil discovery ship essentially so it actually works for that, it’s not really that crazy. The more interesting one actually is the name of the robot dog. SS: Macula, and if you run that through a Latin translator it’s a very fun result, a funny result. SS: No, not really, that’s not the meaning I was intending by using it. SS: Absolutely, it’s a little Easter egg in there.. The names are all… have a purpose even though ultimately the idea of names and naming is sort of irrelevant to what’s going on in “The Vault” but still it’s sort of a good touchstone for people thematically. 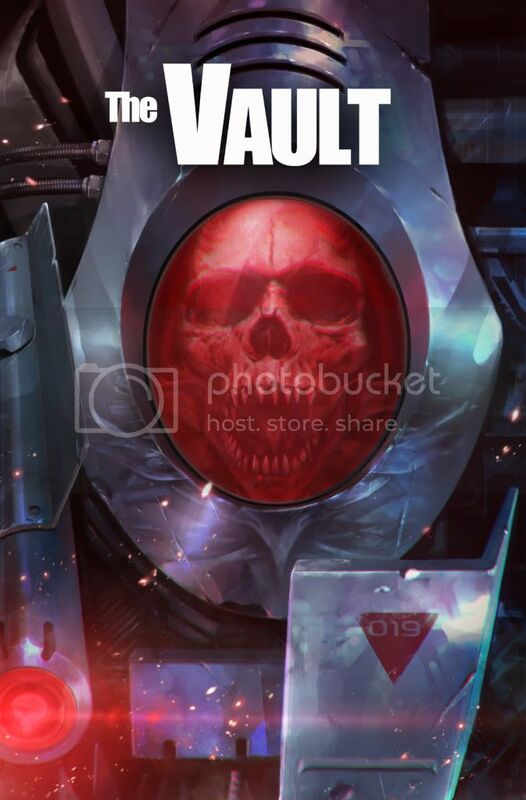 JDR: So why did you name it “The Vault”? 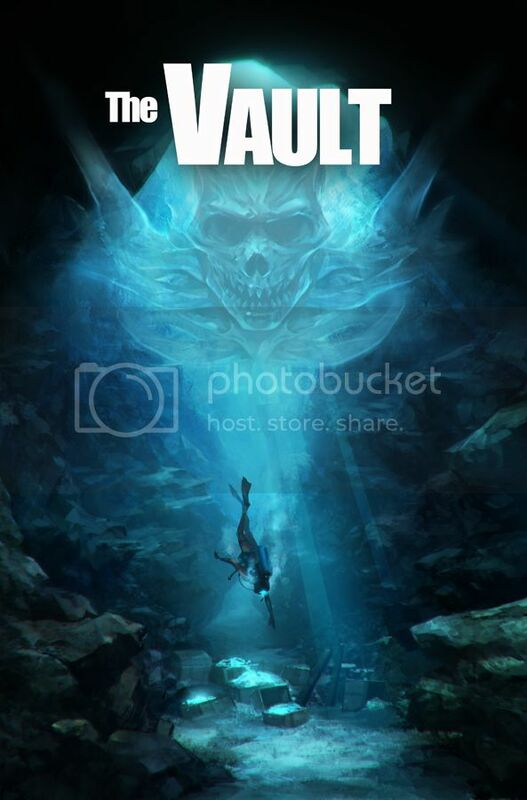 SS: “The Vault” also has a double meaning, the vault is a place of treasure and it’s also a vault of inner chambers, under churches that can contain money or other “stuff”. JDR: While we are on names, you’ve used Michael in “Caliber” and now we have Michael again. Is there a Michael in your family? SS: No, but I had a very close friend growing up named Michael and it’s more about that angelic connotation. And Michael, the character in the story, is probably the least religious character. I wouldn’t tag him completely as an atheist, but certainly he’s not open to supernatural things. SS: …he’s the doubting Thomas. JDR: Are they old enough to read what Daddy’s written, or are they little ones? SS: No, my daughter reads my stuff…my son looks at the pictures. They’ve come with me to some of the conventions before and actually my daughter this year at San Diego Comic Con out sold all of us in an hour, she stopped people…and she sold like eighteen books in one hour! JDR! I love her, she’s great! JDR: I’ve heard that the first printing has sold out! SS: That was another shock, we sold out in a week! For a brand new book…I mean it’s not unusual for a series that people already know to sell out, But for a brand new story that people had never heard of until a month ago was exciting to get that. JDR: I’ve been watching, and you guys are now on Amazon and wondered if y’all were going to e-pub this? SS: Yeah, it will actually come out on www.comixology.com on August 31st. SS: OK… a shameless plug, I did a lot the work on “The Vault” on the iPad. I did a lot of the visual research just on the internet, it was so great, you can surf the web, find an image, touch it, save it and send it. So what I would do is I'd find [information] for “The Vault” and “Caliber” as well, they're all full of art history references, like a lot of paintings and sculptures and stuff are put in there. So for “The Vault” especially there’s a lot of design that I would find and send to Garrie Gastonny and Imaginary Friends Studios and then do their own research, but when they’d send sketches back to me, with the iPad, I could actually draw my notes on the sketches with a stylus and move things around or even add an image into their image and email it back. It was an incredible process that probably saved us like at least a month or two overall in work. It really saved a lot of work. JDR: I remember when the fax machine virtually did the same thing, it changed how we worked, how things got done. A few years ago when we all got fax machines in our offices, instead of having to messenger contracts, plans, designs, whatever… over to someone’s office and then wait for them to messenger us back their changes. With the new fax machines, we could send the paperwork back and forth by fax in minutes. So the tablet computer has certainly changed how we work. SS: You know it’s really amazing, if you think about it, somebody was telling me about their two year old picking one up, but if you think about what it would take if you put someone from the year 1000 in front of a super computer from 1970…the best computer from the world in 1970… they maybe wouldn’t be able to even find the “on” switch. You could take somebody from the Stone Age and put a tablet computer in their hands and they'd figure out what to do with it, probably within an hour. He said the learning curve thing, the adaptation of it as a tool when you put it into the context of like how much easier it is to adopt, even from our own limited technological life span…it’s insane! It’s crazy how easy that thing is to use. JDR: I know, my four year old god daughter is a genius at these things. I learned how to use it by watching her. She has no fear! SS: That’s right! My daughter got her tablet computer on a Friday and by Sunday she had written a song on it, and I'm like…it’s amazing. JDR: Sam, you mentioned that you could add a picture within a image in creating “The Vault” and that brings me to your work with Garrie. Garrie’s work is brilliant! You're the wordsmith, he’s the artist and you guys kind of flow like one person, one mind. How did you guys find each other? SS: Well IFS (Imaginary Friends Studios), they sort of hooked up with Dave Elliott (Current Editor-in-Chief at Benaroya Publishing), Barry Levine, those guys and Edmund Shern at San Diego Comic-Con several years back and Garrie was the one, I think, who most responded to the material in “Caliber”, like they sort of decided themselves who was going to do what, you know when you send things to Imaginary they have people who can do almost anything, really any kind of image. You know Stanley “Artgerm” Lau who did the cover for “Caliber” – Stanley’s taken off, he’s huge, Bagus Hutomo who did the cover on “The Vault,” they're all really solid artists in their own right. Dave Elliott has really helped to get them a lot of exposure in the Western comic world. Garrie did this incredible book that actually has some similar themes as “The Vault” that Warren Ellis wrote called “Supergod” which is amazing also if you like “The Vault” you should check out Garrie’s work in “Supergod,” it’s beautiful, the trade paperback will be coming out soon, it’s a five issue series. I'll go back and look at the description for a page of script for a comic, you do lay out a fair amount of detail about what you want to see on the page: it’s three panels, this guy’s on the right side and he’s mad…you put all of that in, but still, you know, it’s in your head and there’s a limit to how much you can get and I'll go back, I'll look at Garrie’s drawing and then I'll look at my description and I'll go…how did he figure all that out from what I said, from what I wrote? It’s the fun part of “Caliber,” and especially “The Vault”. You know it’s literally like having someone who can go in your head and put your dreams on paper, and that’s what it is. It’s a pretty incredible thing to realize a vision like that which you kinda can get in filmmaking but it’s different because it’s a more closed loop in the comic book. As if we all work together, Dave Elliott, my editors and everyone, Dave was the one who basically taught me to write a comic book. And he also taught me in terms of pacing and did a critique of “The Vault” which I agree with, but it’s kind of a necessary evil, which is very story dense at the beginning, and that’s all because I don't want to write the kind of comic that just sort of is lengthy visuals and not much happening. 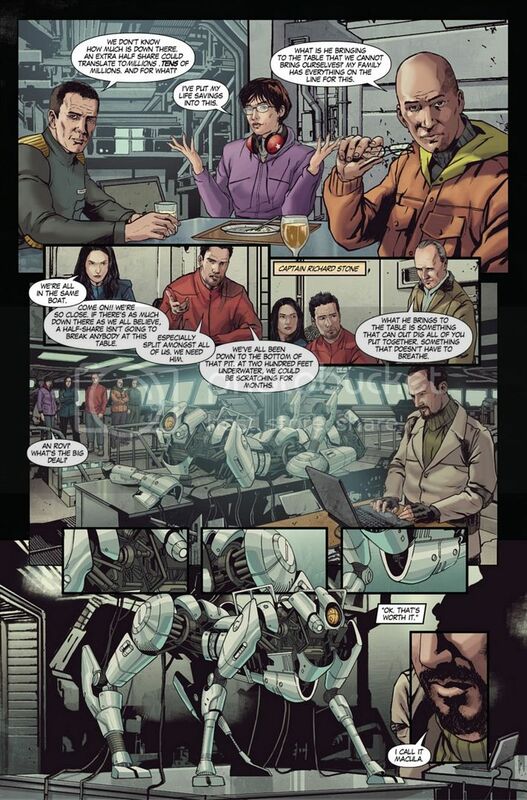 So you know it’s hard to strike a balance when you get into the second issue and then in the third there’s a lot of exposition, as you'll see. JDR: Anybody who reads a book or sees a movie knows that you've got to get a certain amount of information into the reader’s head early, or you're going to lose them. 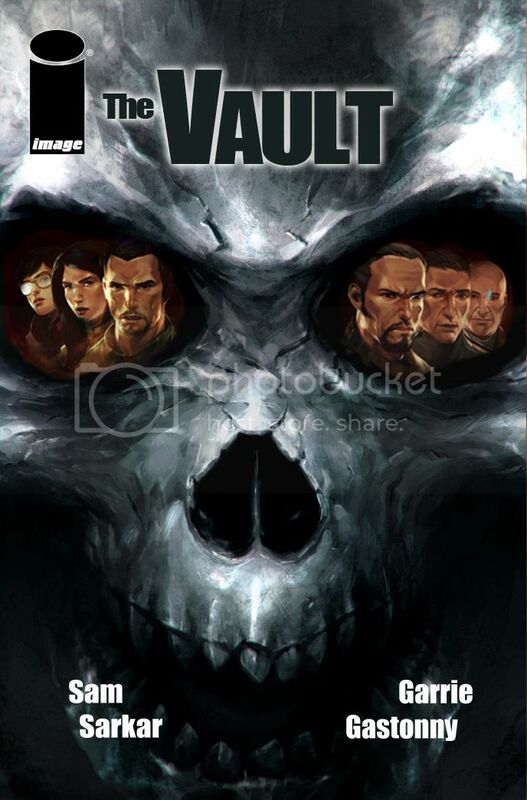 Oh, that reminds me, will there be a trade paperback for “The Vault”? SS: Yeah, there'll be a trade paperback towards the new year. Hopefully we'll put in some extra artwork and a few other funs things. JDR: You guys know your audience, this is great news. Let me add, while I have you, that your people are just the best! I've been blessed to have interviewed many authors who are aligned with Mr. Depp and the production company and everyone is just so nice and easy to work with! Your self included! As my Mom liked to say, “there’s not a stinker in the bunch.” Everyone is great. SS: We are very lucky, I'm knocking on wood. You know, we are very fortunate in the quality and the trust that we've gotten from authors of all kinds, whether it’s novels or comic books, people have put a lot of faith in our commitment. It’s hard, in this day and age it’s really, really tough to get quality literary movies to the screen and you know thankfully Johnny’s a big champion of that kind of stuff or else it wouldn't get done. I mean it wouldn't even be in the system. JDR: Exactly, so as the audience for both the books and the films… we are doubly blessed to have so many caring people on both sides of that fence. SS: And they know, a lot of them deal with Christi and they know that if they have her watching out for them, they will be taken care of. JDR: I've read as many of your interviews as I could find that are out there, because I wanted to come up with questions that are not duplicates, but some things I just have to ask. I think the Oak Island story and the Sable Island back story with the horses are just fascinating! Can you expand on that for the readers who don't know about these places? SS: Yeah, absolutely. 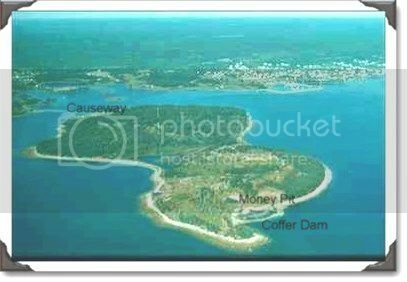 Oak Island, I grew up with as a kid. And by the way, I never tire of talking about it because it is one of the reasons that I wrote it. So, I hope this drives people to go to Nova Scotia because it’s very beautiful. 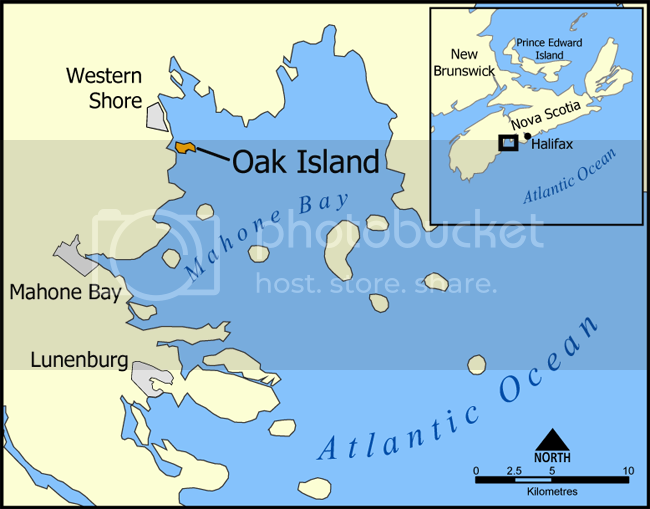 That area where Oak Island is, is gorgeous! I spent most of my teen aged years there in the summer time. The Flying Dutchman was actually spotted a lot of times off of Oak Island, you know, the ghost ship. SO it’s full of folklore and I used to go there when I was a kid, this treasure pit thing was a big deal, it was the mystery that has confounded people for over two hundred years, very high profile people over time. It began in 1795 with these two teenagers who found this sort of degraded block and tackle hanging from a tree and this indent in sand and they started to dig it up and ten feet down they found an oak platform, they lifted it out, they dug another ten feet and found another one, so they were sure that they were going to find something. But when they got down to, I think thirty feet they couldn't dig anymore, they weren't hitting anything so they closed it all up and they came back seven years later with more tools and finally they got down to like sixty feet, went away for the night, when they came back the whole pit had collapsed and was flooded, and they couldn't figure out what had happened and in subsequent digs they found out there is a channel that is cut sixty feet down (or it may be a natural feature, but most people don't believe that). It runs a thousand feet out to the beach and floods the pit when the tide comes in. So it’s proven to be really difficult to excavate, to get to the bottom, so at another point somebody dug a shaft beside the main shaft to get down. But it’s really deep, it goes down I think, the lowest they've gotten is over two hundred feet. So for a treasure, that’s what made everybody think, OK – if somebody went to these lengths? There’s something really major down here. There’s something really, really major. And so it’s always been theorized, there are a lot of sea caves in that area, that the pit might lead into a natural cave formation under the island. There’s all kinds of crazy stuff, and over the years as it became known as a possible hiding place for the Ark of the Covenant, the Holy Grail. The (Knights) Templar did it, it was a ransom that was supposed to have been paid between England and France but then somebody high jacked the cargo. I mean there’s all kinds of stories and I had always thought as a kid that my take on it was that what if you did get down there and you find something and that you were not supposed to dig up. That was really the beginning of it when I was about sixteen years old. And Sable Island is like sort of another mythical place because of all of the shipwrecks and that’s pretty easy to imagine, it’s a tiny little piece of sand surrounded by shoals and rocks in the middle of the Atlantic and it’s really on the path as you're coming across from Europe towards Halifax, so it was a real treacherous spot for sailors and shipping in the 1700's and 1800's so it’s just surrounded by shipwrecks. I think it has more shipwrecks than the Bermuda Triangle. It’s just loaded with them. But of course, they get destroyed over time by the ocean, so there’s not much physically left of anything but there are artifacts surrounding the island. 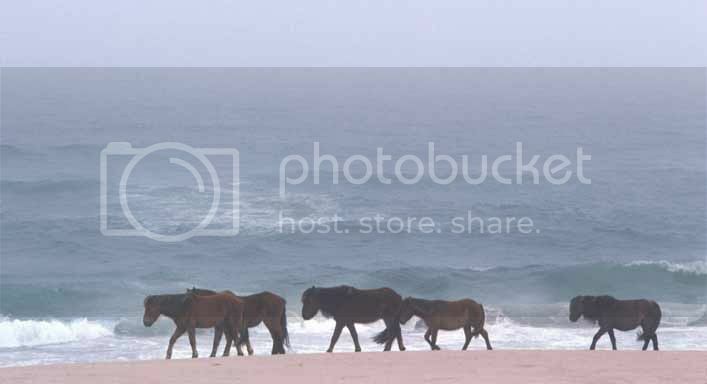 So it was just the perfect spot, and the horses are real there too, they're called the Sable Island ponies and they were wrecked there sometime in the 1860's and it’s just kind of a miracle that they survived. There’s just this little spit with grass and not much fresh water, they survived somehow…a very hearty species. JDR: This is sort of the think that Tim Powers says is stuff that’s too cool not to use. SS: Yeah, and that’s what we tried to do with “Caliber” also, we are always trying to explain the world, you know…why are we here? How did we end up here, what are all of these mysteries, do they add up to something that gives us a clue as to whether we're an accident or we're here on purpose. So whether it’s the pyramids, which I tie into this, I'm just a pyramid fanatic, or the statues on Easter Island, Stonehenge…there a megalithic site on the island of Malta, I mean all over the world, you've got these kinds of things. And your mind just naturally wants to make sense of it all and so you try to tie it together. And so this thing in my mind – this is my version of an explanation for all these sites. The other thing that I was inspired by, and again it started with Nova Scotia, and reading all these things about the Holy Grail search and the Knights Templar led me to some sites in France that are really famous in these stories and these sites are medieval sites and they are also where some of the cave paintings are. So I went into a cave where there’s art from ten thousand, twelve thousand years ago, it was really shocking. It was a serious shock, because if you've seen photos of cave art it’s one thing, but when you're actually in the room where it was done, it really takes your breath away, there’s nothing else like it in the world. Because you suddenly have a sense that whoever did this twelve thousand years ago, not only were they talented, but they basically have the same thought process of mystery that we all do. We realize when we go and see the cave painting that they're not just drawing junk and graffiti, they're drawing very specific images of animals, not necessarily ones that they hunted, actually, it’s not that. They are drawing horses, ibex, buffalo and these weird symbols and stuff and you don't know, you're trying to figure out what they meant by it. JDR: Is this what maybe draws you to mythology in your writing? Your work seems to be based in mythological ideas, and as you said, use of the pyramids and the magic that surrounds them, has this (interest) been with you all of your life? SS: Yeah, I grew up in a very multi-religious household. My Mom and the Filipino side of my family is very Roman Catholic, so the other side, my Father was from India and he was Hindu so I had a mix of religions. My Godparents are Muslim. It was all doctors and stuff, my Mom’s two best friends were Jewish, so being exposed to all of those platforms, and my Mother really, to her credit, wanted to know everything about other people’s faiths. And so we would look at these things together and she had this book about world mythology and the origins of different religions and she really herself was very interested in the common roots of people’s religion and I think I carry that over in that I do believe that there’s certainly this common ancestry to all of our thinking on religion and I'm not cynical in thinking it’s something that we need or that we're biologically hard-wired to worship. I really do have a great sense that there’s an unfathomable mystery to all of it, that big question mark of why are we here… it doesn't get better than that. It’s a wonderful thing and it’s not obvious even when…I spent a lot of time researching physics and physics isn't any closer to coming up with a hard and fast answer to the birth of the universe than religion is. It might sound better, if you use experimentation to back it up but if you ask and credible physicist the latest, greatest theory from the Stern collider can be undone by another collider that has yet to be built a hundred years from now. It’s fun to think of all those things and then one of my inspirations for this (“The Vault”) was “2001” and I'd read a lot about how Kubrick and Arthur C. Clarke put it together and it’s similar in a way, there’s a lot of exposition up front in “2001” and then nothing in the middle, it’s just all mystery. From a certain point on in the story it’s all mystery, but when you look at the details that went into the movie there was something like forty three consultants in different fields of future technology that weighed in on the movie: Carl Sagan was one, and then the alien life form, all of the things that you see in the film and that are in Arthur C. Clarke’s book have an enormous amount of research, but you don't feel it, it just sort of goes by. And that was the thing that kind of inspired me to tap history and sort of present day and future technology and to sort of try and put it together that way. JDR: It’s brilliant! Is there one question that you are waiting to be asked? JDR: Great answer!! LOL You've just been so great about sharing so much! I've been going through my notes and questions and crossing them off as we go along, you've shared just so much! SS: I'll tell you, the fun thing about “The Vault” is that it’s a story that obviously I thought about for almost thirty years, since I was a kid, so it takes that length of time to gestate an idea, but the fun thing for me actually is I'm hearing from other people, like writers who we're talking to possibly for the other movie side… other people’s theories on what it’s about. And I really think that’s cool because in a way, sure, you can interpret it anyway you want. What it is, where it came from, who they are, what it’s about, you can have your own explanation. I kind of don't want to go too much into detail about things, because as I'm going to expand the story to other places but I kind of like leaving the mystery and seeing what other people will suggest is behind all of this, seeing if I can find a way to keep it mysterious. Keep the question mark, because in a way that is the mystery of faith if you're religious. There actually isn't hard proof, whatever proof there is, there’s always another physical explanation. And I think there’s a good reason for that because if you really have incontrovertible proof of the supernatural then you don't need faith, faith doesn't exist anymore. And I've had some weird miraculous things appear to me in my life, you know, bizarre things…photographs and different things and later found ways that you could explain that this way…but that still hasn't shaken what I believe. And I kind of like that, when you really try and pin something down I think it’s less exciting. JDR: You know, I think you're right, if you're enjoying a good mystery, a book, a movie, whatever, you don't want it to come to an end. JDR: Often times the stories that don't have a pat ending, that allow the reader or viewer to figure them out are kind of the most satisfying. JDR: You mentioned that you're going to take this to other places, does that mean that we'll have other series of “The Vault” after this concludes? SS: Yeah, that’s my intention. I would like to keep going, not just in the present story line but there’s sort of some past stuff. I'll give you one interesting little tidbit that’s in both. It’s actually in “Caliber” a lot, and you'll see it directly in the next issue of “The Vault” - there’s a symbol that I use that’s attributed to an English mathematician and astrologer, witch, magician named John Dee, and John Dee was the original “007” – some people say that he was the inspiration for Prospero for Shakespeare and the claim is that he is the one who summoned the storm that sank the Spanish Armada. He’s a fun character, he’s a really, really fascinating, fun character and so I want to tie a story to him because that symbol…you'll see it in the next issue, is attributed to him. These are the fun little research pieces that I've found over many, many years. 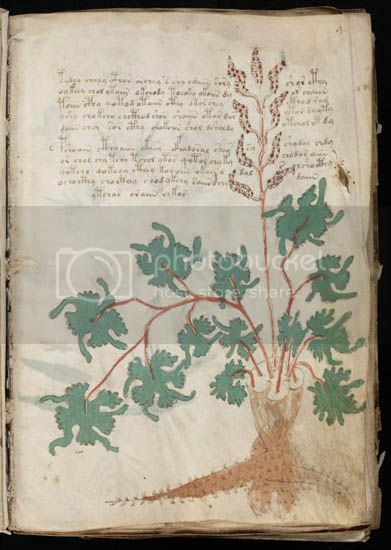 There’s another piece that’s attributed to him that’s in the Harvard Rare Manuscripts Library, it is a text called “The Voynich Manuscript” and it’s this bizarre writing that looks like something out of J.R.R. Tolkien’s Middle-earth, and no one, to this day, has translated the book. It’s an unknown language, they don't think it’s gibberish because it seems to obey the patterns of natural language, but it’s a total mystery and it’s attributed at some point of having been in John Dee’s hands. So I'm going to tie that in, at one point I'd like to do an early prequel story that touches on that. JDR: WOW! That would be cool! SS: Yeah, that would be very fun! JDR: Well you said that you'd done a lot of research and this sounds like it’s been going on for all of your life. SS: Yeah, exactly. That’s the fun thing, maybe in a way it’s me trying to make sense of it all. JDR: I think that’s a great idea because that we get to go along for the ride. So we can look forward to volume two in the next couple of weeks? SS: It comes out end of August, I'll check with Dave, but I think the next issues comes out at the end of August and then the following one, you may have to wait a little bit longer for, it depends on how quickly it gets done. JDR: We don't want to hurry the artist! SS: LOL That’s right. One thing I want to add, in writing it, a fun thing that I discovered was that those two main characters, Michael and Gabriel have a really interesting complexity to them, and that’s again maybe a nice product of here I am in my life, about people’s working relationships and how things can get a little weird. What happened with them is from my love of “The X-Files” and its chemistry, but you don't necessarily see it as a full blown romance, they're partners. As I was writing it, it evolved into something else, I think people who like that sort of undertone… I'm a softie when it comes to the under currents of a good romance, again when you think about “Alien,” “The Abyss” you know they have a really fun central, complex relationship, even in “Alien” the relationship between Ripley and Dallas, you can feel it, there’s a chemistry between the two of them. But they're at odds at a certain point in the show…but there’s definitely chemistry and you have a great sense of loss when Dallas is gone, it’s like a loss for her. JDR: You're right about that. You have great characters and a great story, I honest to God hope his gets made as a movie. Would you be looking at live action or CGI or animation…some or all of that? SS: It'll be a live action. JDR: That will be so cool! And with that, I think this about ends my questions today, thank you so much for speaking with me and for being to gracious and generous with your time! SS: And thank you Karen, for all of the work you've done for the books we've had over the years, it’s been great! JDR: I figured you'd be able to give me about ten minuets and we've been talking close to an hour. I know that there are bigger fish out there in the ocean that are wanting to talk to you today. You are a busy kind of guy! SS: Yeah, LOL, but it’s a good busy! I had the time, and this was fun actually. I did Comic Con and the following weekend I did take some time and went off the grid. JDR: I thank you again, and hopefully we'll speak again further down the road. JDR: Thanks again! And congratulations! Isn't Sam amazing!! And I have to thank the fabulous Gianluca Glazer for making all of this happen! Born in Halifax, Nova Scotia, Sam Sarkar is a 23-year veteran of the entertainment industry. He began his career as an actor and was one of the leads on the long-running, syndicated television series Neon Rider. Following the series, Sam decided to pursue writing and worked for the hit television series Beverly Hills 90210. Stemming from his work on the show, he also co-wrote a television pilot for Spelling Entertainment under the direct guidance of TV legend Aaron Spelling. Deciding then to embark on feature films, Sam took some chances, following a varied path of writing screenplays and working as a sound technician. In 2004, after working on several films with actor Johnny Depp, Sam was asked to help run Depp's production company, Infinitum Nihil, headed by Christi Dembrowski. As Senior VP at the company, he continues to serve the varied needs of Hollywood as an executive, producer and writer. As always we ask that you not copy and post elsewhere without my permission. Please do share the link to this interview!